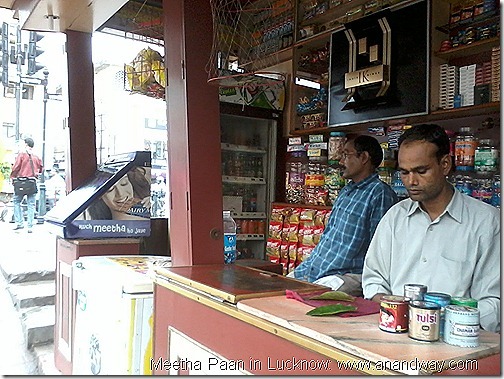 Lucknow’s meetha paan has been my long favourite at this corner shop, near Cathedral, in Hazratganj, Lucknow. 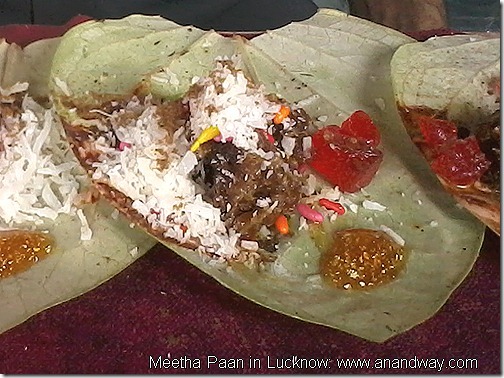 Meetha Paan is largely popular in North India, Lucknow, Varanasi and Patna. The variety of ingredients that goes into it is amazing. Each paanwalla or Paan seller has their family recipe, handed down through generations. Maghai paan or betel leaf, dessicated cocunut, green cardamom, clove, kewra, rose preserve, tutty fruity, peppermint, and sugar coated fennel, kathha, choona, supari (betel nut used in puja) are some of the ingredients that I recognised as a child. Every wedding dinner ended with a meetha paan from the paan stall on the way out. Meetha paan is different from regular paan as it does not have tobacco, and is safe for children. Some ingredients I still don’t recognise, but enjoy every meetha paan from different panwallas, marvelling at their combination! Paan has been long used as an item in worship and sacred food ‘prasadam’. Betel leaf is a mouth freshner and kills bacteria. It regulates digestive juices and aids digestion. In Ayurveda, we say, “Food is preventive medicine,” and all diseases are rooted in the improper functioning of the digestive system.